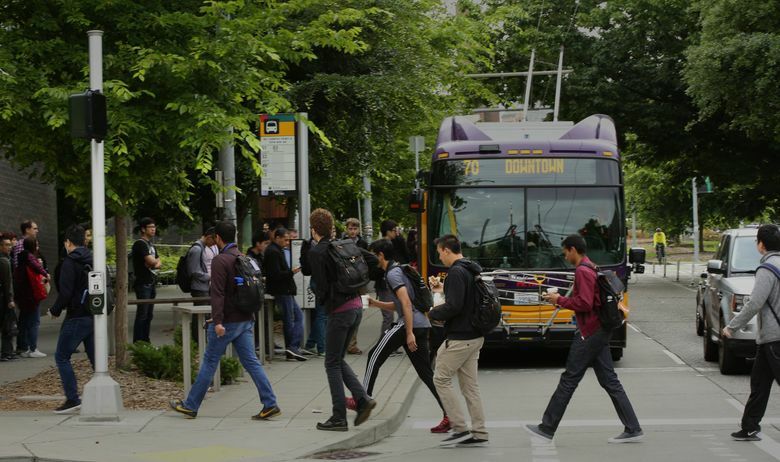 With about 900 Amazon interns living at the UW for the summer, King County Metro is shuffling around bus service to accommodate them. It’s become an annual tradition: Right around the summer solstice, Amazon’s summer interns arrive in Seattle in droves and King County Metro adds bus service to try to keep them — and the rest of us — moving. For the fourth year in a row, about 900 Amazon interns are staying at the University of Washington this summer. Amazon’s corporate housing partner is paying the UW about $4.4 million to house and feed them, a UW spokesman said. And for at least the second year in a row, Metro is adding buses to the popular Route 70 to help ferry all those interns from the UW campus to Amazon’s South Lake Union campus, and back again. Traffic Lab is a Seattle Times project that digs into the region’s thorny transportation issues, spotlights promising approaches to easing gridlock, and helps readers find the best ways to get around. It is funded with the help of community sponsors Alaska Airlines, CenturyLink, Kemper Development Co., NHL Seattle, PEMCO Mutual Insurance Company and Seattle Children’s hospital. Seattle Times editors and reporters operate independently of our funders and maintain editorial control over Traffic Lab content. Metro added two daily buses to the route in March and three more this month, the latter to accommodate “continued growth in South Lake Union and an influx of summer interns,” Metro spokesman Scott Gutierrez said. Amazon is also operating four private shuttles a day to transport interns between the campuses, a spokeswoman said. Here’s our story from last year on how Amazon interns — just the interns — can overwhelm bus routes causing both service changes and commuting headaches for other passengers down the line: The Amazon effect: Metro adds buses to handle new flock of summer interns.